When writing unit tests you often need to provide input values to the component inspected. For example when testing a function like combine(_ base: Base, with toppings: [Toppings]) -> Pizza you might want to provide an instance of Base that is gluten free and an array of toppings like [TomatoSauce(), Mozzarella(), Salami()]. Those input values are not test doubles but actual instances of your system's types. To keep the tests focused and easy to write it's good to abstract their creation to another place. This will make your tests shorter and easier to read, their content focused on acting and asserting the system under test, with little distraction in the setup stage. The second example is shorter and arguably easier to read. Having removed the long setup makes it focused only on the testing of the behaviour. a fixed state of a set of objects used as a baseline for running tests. The purpose of a test fixture is to ensure that there is a well known and fixed environment in which tests are run so that results are repeatable. Using factory_bot simplifies the test code setup, while retaining the ability to set values relevant for the behaviour under test. The library is easy to use thanks to Ruby being a dynamic language and the great work of the authors, maintainers, and contributors. Swift is a stricter language than Ruby. I don't know of a way to pass a literal to a function and have it return an instance of a type matching that literal, pre-filled with default values like factory_bot does without having to write extra code. My poor man's approach to get a similar behaviour is to use an extension in the test target, and do some manual labor. A note on using "name" as the default value for the name: parameter. When setting default values in the tests it's tempting to get creative and smart. In the past I was proud of how many references to Marvel comics I could spread in my test suites. In his excellent course Refactoring Rails, Ben Orenstein recommends using boring values for all those inputs that don't matter for the outcome of the test. Ben points out that having interesting input values, code that draws the eyes, makes the reader think the inputs are important for the outcome of the test. But if that's not the case then these smart tests are subtly lying to us. Now let's see how to use these fixtures. If the behaviour you are testing doesn't care about how the inputs are built you can call fixture() with no argument, this will create an instance with all default values. If the behaviour you are testing depends on some properties of its inputs you can set those and only those in the call to fixture(). When working with fixtures I found it's best to violate the YAGNI principle. It's worth spending the time to build a complete fixture as soon as you need it, rather than adding functionality to it when it's required. You should build a fixture extension with all the type's init parameters in its argument list, rather than only the ones needed by your test right now. The extra work you put in creating the fixture will pay off in later PRs, when you or your team mates won't have to go off track to add the support for the input value they need to test against. It'll be already there. Why not a convenience init? The reason I'm suggesting to use a static func rather than a convenience init with all the default values is because calling .fixture() tells the reader the code is getting a test value more explicitly. On top of that, it's not always possible to define a convenience initializer for a type keeping the argument labels the same as the type's properties. So for consistency I prefer to always use the .fixture() approach, which can always be implemented. Where to put the fixtures? 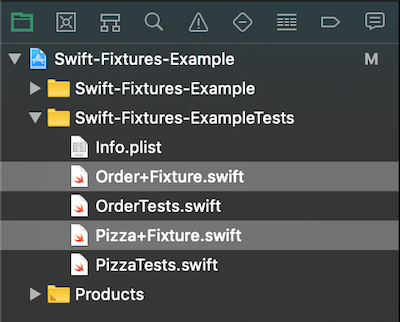 You can either put all the fixture extensions in a Fixtures.swift file in the test target, or used a dedicated Type+Fixture.swift file for each. I prefer the latter. You can play around with the code in the post checkout this example project. Also notice in this PR the difference in the code surface using fixtures makes. If you want to be serious about testing you should put as much effort in your test code as in your production one. The test suite needs to be tidy, its code reading in a way that surfaces what the tests are about, without distracting the reader with irrelevant setup details. The use of fixtures to initialize test inputs with the ability to set only the relevant parameters, leaving the others as default, is a technique that will help you maintain focus and order in your test code. What do you think about this approach? Have you been using something similar? I'd love to hear from you. Leave a comment below or get in touch on Twitter @mokagio.